Had agreed that we'd hook up by BHS to lock bikes, then skirt near JaCey's and into the Buttermarket. Didn't work out. I was early. There, I've said it. Appointed time came and went, then the Motorola piped up its tinny Ms Pacman theme and Andy's text said: meet you there. Alrighty. Opposite the nondescript Cafe Giardino is the home of one of the infamous Nine Caffs. Not that Allders exists anymore; that'll be TJ Hughes these days. 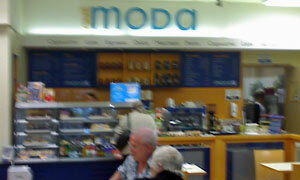 But tucked away on the ground floor of "the big discount department store" is a petite oasis of goodness called Cafe Moda. Expectations weren't great faced with a bunch of prepack sarnies and baguettes, though last week we'd have killed for such edibles. Slightly fresher should be the panini: tuna, please, plus a Latitude lemon ice tea (nice). Still waiting for Andy, got chatting with an old dear at the next table. I normally come out with my son or daughter, she said, but they're both on holiday. I was a Land Girl, you know. I used to build Spitfires (she showed me a badge on her coat). I was one of nine children. And here's Andy in his hi-vis, carrying his fold-up boneshaker. And here's my panini, presented with some well-dressed salady bits. And here's the elderly lady, again: I like to get out of the house. I use the free bus. Some little boy looked at me the other day and asked why aren't you paying? I used to go dancing in the town centre. She likes to chat, which is fine by us, and we touched on local landmarks like Sarony's and Arlington's. I escape briefly and return to the counter to order what Andy's just finished, a mahoosively impressive jam and cream scone. Ooh, and a double espresso with some foamy milk would be super, thanks. When I get back, the lady is talking about how she met Churchill at the airplane factory. She used to be a Land Girl, you know. Couldn't get a word in edgeways with Andy. If it was a car -- Messerschmitt KR200. If they were passing by -- Robert Hardy.